The raw food recipe for quick, easy jam is a lot better for you than jams or jellies that are LOADED with sugar. Fresh summer berries are delicious right out of the garden, but when the garden is producing more than we can use, I make a batch of this raw food version of jam to keep up. 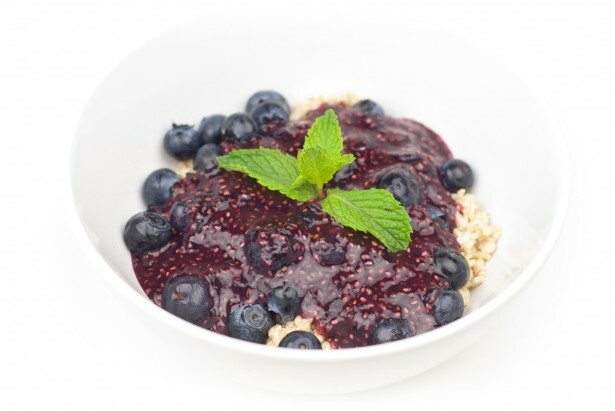 The only gelling agent is chia seeds, the only preservative is lemon juice, and the sweetener the ripe summer berries and a dash of organic grade B maple syrup. And each of these ingredients carry their own benefits, so I feel great serving it to my family. Chia Seeds are high in Omega 3s, a source of easily digested protein, iron, calcium, and fiber (see a complete post on benefits of Chia Seeds by clicking here). The act as a natural gelling agent that forms the mixture into a jam. Lemon Juice is a natural preservative that keeps the color of jam bright and gorgeous. It is also a great source of that antioxidant vitamin C.
Grade B maple syrup may sound like you are getting a lesser quality syrup, but in actuality it is just the second tapping which yield a slightly darker syrup, that is higher in trace minerals and a richer natural sweetener. Berries Today’s jam was made with a collection of berries that were ripe and waiting to be picked, blueberries, strawberries, Marion berries, blackberries, and some red currents. This offers a healthy bouquet of phytonutrients, antioxidants, vitamins, minerals and fiber. Choose whatever berries you like. Start by soaking chia seeds in 1/2 a cup of water or apple juice and one tablespoon of maple. If you are using a berries that is not very sweet, like currents, you will need to use the second tablespoon of maple. Leave the chia seeds to soak until all the liquid soaks into the seeds and you have a gel. Put the chia mixture into the Vita-Mix with your fresh berries and blend until smooth. The mixture will be similar to a smoothie. Refrigerated the mixture to allow it to firm up slightly. If you want the mixture thicker and more firm, stir in another tablespoon of chia seeds. This jam is delicious on fruit bowls, toast, ice cream (raw recipe for ice cream), brownies (raw recipe for brownies), or anything that will hold still. This jam works as a freezer jam, but not for canning. Since it is so easy to make, why not whip up a fresh batch once a week with seasonal fruit? ence behind raw food nutrition. If you are ready for a weight loss detox diet that works, tastes great, and involves eating delicious foods and no starvation then this is the weight loss detox for you. What will you look like in your Rocking Body? Thanks for the recipe. Tonight I made an almond butter and raspberry cracker sandwich. Made my own jelly just mashing up raspberries. Wish I had seen this blog first. Mashed up berries are the best jam! This recipe might keep a bit longer, be a little sweeter and mock the consistency of jam. But I’d say you are the big winner in terms of sweet, simple goodness on your raw PB&J. Thanks so much for the recipe . . . going to try it today. I must say, though, that while the Rocking Body Raw Food book looks like it has a lot of great info, the blatant use of a sexualized and objectified woman’s body means I won’t be buying it. I’m sad that the author/designer/whoever decided to put that on the cover. It sends a lot of powerful, albeit silent, messages of inadequacy to most of the women who see it, and blatant sexual messages to many of the men who see it. The information in a book should sell it–not destructive soft p*rn on the cover. I hear you on the objectification of women. This was a case of me coming out of my shell and celebrating my figure and fitness after struggling so long. 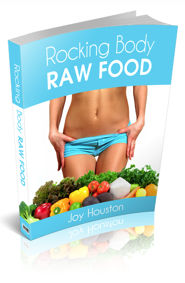 Raw food changed my body, but it also helped my own personal power shine. I respect and thank you for sharing your opinions with me. Glad the recipe appeals to you. I hope you enjoy it. Does anyone know if this is freezable?